Twenty years ago, actor and philanthropist Tom Jackson brought artists together to spread awareness and garner support for those in need – and the Huron Carole was born. Join Jackson and friends when this nationwide tour – which raises funds for food banks – comes to Ottawa. The event is a project of the Christmas and Winter Relief Association and includes songs and stories of peace and optimism from popular Canadian artists such as Sarah Slean, Del Barber, and Susan Aglukark. Thursday, November 29, 9 p.m. $60, VIP $110. Shenkman Arts Centre, 245 Centrum Blvd., www.huroncarole.ca. 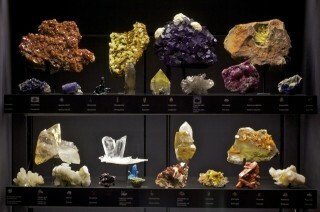 Close to 1,000 minerals, rocks, and gems, most from the museum’s collections, are displayed in the Canadian Museum of Nature’s newly expanded Vale Earth Gallery. Photo by Martin Lipman, Canadian Museum of Nature. Geology nerds, take note! After three months of improvements, the Vale Earth Gallery at the Canadian Museum of Nature is opening to the public once again. The gallery serves up a fascinating experience for young and old, bringing visitors on a journey through the earth’s geological formation, its shaping over billions of years, and demonstrating how geology and mineralogy are important in our daily lives. Some activities on the bill include building a volcano, causing an earthquake, exploring a limestone cave with a dripping waterfall, and making different kinds of rock by simulating geological forces. Now that’s what we call a rock star (ha ha!). Friday, November 30. $12, seniors $10, kids $8, infants (under two) free. Canadian Museum of Nature, 240 McLeod St., www.nature.ca. Join local artists and art lovers at G101’s annual fundraiser, re-branded as 101 Unframed. Come with cash in your pocket, as there will be a with a silent art auction to celebrate their “29 FOREVER” anniversary, along with the launch of a new retrospective website that looks back at G101’s history. This non-profit, artist-run centre is a proud supporter of the arts in Ottawa and has been instrumental in developing connections between artists, their work, and the public. Members of the Bruce House will also be present to accept donations for World AIDS Day and A Day With(out) Art for their ongoing support for individuals living with or affected by HIV/AIDS. Saturday, December 1, 6:30 p.m. $10. Event takes place at Enriched Bread Artists, 951 Gladstone Ave., www.g101.ca. PeaceMidan, a global not-for-profit organization of social entrepreneurs, is teaming up with Human Concern International to hold a gala in celebration of bold new strategies and initiatives promoting change in the Middle East, North Africa, and Turkey. This fundraising event will feature prominent speakers and performers who will address various topics related to sustainable peace in the region. The Ottawa gala is the first of many Canadian dates, and comes as a follow-up to an initiative called 320Reality. This project offers individuals all over the world an opportunity to submit a short video with unique ideas on how to achieve sustainable development and peace in these regions, and gives contestants a chance to gain financial support for their endeavor when the winner is chosen in September 2013. Saturday, December 1, 6:30 p.m. $50, students $35. Palais des Congrès, 50, Boulevard Maisonneuve 3e Étage, Gatineau., www.peacemidan.com/gala . Every generation grows up watching Christmas classics, from Rudolph the Red-Nosed Reindeer to Miracle on 34th Street. One movie that has become a holiday hit – and some might argue the ultimate Christmas movie – is Home Alone. The 1992 movie, full of mishaps and mayhem, would even make Scrooge himself laugh. Since Centretown Movies is screening the film outdoors, be sure to bring lawn chairs and blankets (free hot chocolate will be provided). The McNabb Community Centre will be open for filmgoers to warm up and use the facilities. Saturday, December 1, 5 p.m. Pay what you can. McNabb Park, 180 Percy St., www.centretownmovies.wordpress.com. Take in a Japanese tea ceremony at the Ottawa Tea Festival. Photo by Richard Tardiff. Experience the wonders that tea has to offer at the 2012 Ottawa Tea Festival. Exhibitors and tea specialists will be on hand to immerse attendees in tea history, workshops, tastings, and pairings. For all the foodies out there, artisan food producers will also be on site to provide chocolate, honey, and other sweets to enjoy with the wide selection of teas available. The culture surrounding tea and its long history will be explored through Indian and Sri Lankan music and dance performances, a Bollywood performance, and a Japanese tea ceremony. Better yet, the festival will also be donating proceeds to the Asha for Education Canada organization that supports the improvement of educational facilities, housing and clothing for impoverished children in India. Saturday, December 1, to Sunday, December 2. $15 advance or $25 at door. Various locations, see website for details, www.ottawateafestival.com. December is right around the corner, so kick off the holiday season with an event the whole family will love. At the Vintage Christmas Village of Lights you can experience the wonders of Christmas through the lens of the past, as the quaint village bursts with holiday spirit and décor. Activities include handcrafting ornaments for the Christmas tree, decorating a gingerbread man, and taking a ride through the beautiful village on a horse-drawn wagon ride. Santa Claus will even be on hand to take special requests for gifts. ‘Tis the season… Saturday, December 1, and Sunday, December 2, 3 p.m. $7, students $5, seniors $5, families $18. Cumberland Heritage Village Museum, 2940 Old Montreal Rd., www.ottawa.ca/museums.